A great treat for the kids and so easy to make. 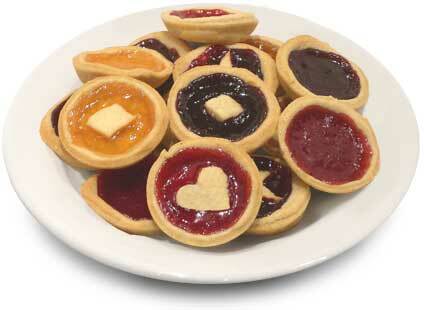 Follow our easy step guide to bake yummy jam tarts! To make the pastry, put the flour and butter into a large bowl and with your hands, rub in the mixture using small amounts of water until you are able to form a ball shape. On a lightly floured surface, roll out the pastry to ½ cm thickness. Use a round cutter to cut discs of pastry, slightly larger than the hole in the tin, then press down into each hole. Spoon your strawberry jam into each pastry case. With the left over pastry, cut small shapes and place on top of the jam. Bake in the oven for ten to fifteen minutes or until golden brown. Remove the tarts from the oven and cool on a wire rack. All that’s left to do now is to eat and enjoy!